If you're in need of some summer sweets and want something super easy-to-make, I think you'll appreciate this guest post recipe that is courtesy of Viki's Original Granola. You'll only need 4 simple ingredients to make them and they taste absolutely delicious! Viki's Original Granola is a blend of gluten-free oats, organic honey, almonds, pecans and unsweetened coconut. It is simply, the best tasting, good for you granola. Place cream and butter into a saucepan. Allow butter to melt on medium heat, stirring the whole time. Raise the heat just until the cream mixture comes to a boil. Remove saucepan from heat, add the chocolate and stir until it is completely melted. Continue stirring until the mixtures thickens and cools a bit. Cover mixture with cellophane and place in refrigerator. Allow at least 2 hours to cool and thicken for at least 2 hours but mix 3 to 4 times during that time. To form truffles use a small melon baller or spoon to scoop chocolate mixture into the palm of your hand. 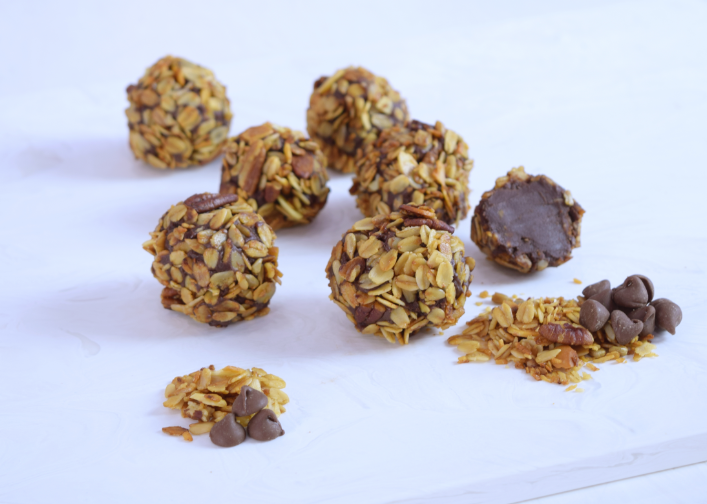 Roll into a ball then roll in your favorite Viki's Granola. Place completed balls on a parchment-lined tray and refrigerate before serving. This is a simple recipe for truffles that sounds delicious. I would add some instant coffee to the cream mixture in order to make them less sweet.